Cheyenne: - Do you know anything about a guy going around playing the harmonica? He's someone you'd remember. Instead of talking, he plays. And when he better play, he talks. Before I begin to mention what this film is about I need to state that this review will be completely biased & comes from somebody who rates this one of the two greatest pieces of cinema ever created & finds the film perfect in almost every single way so please forgive me should this review be one sided & a little long winded. 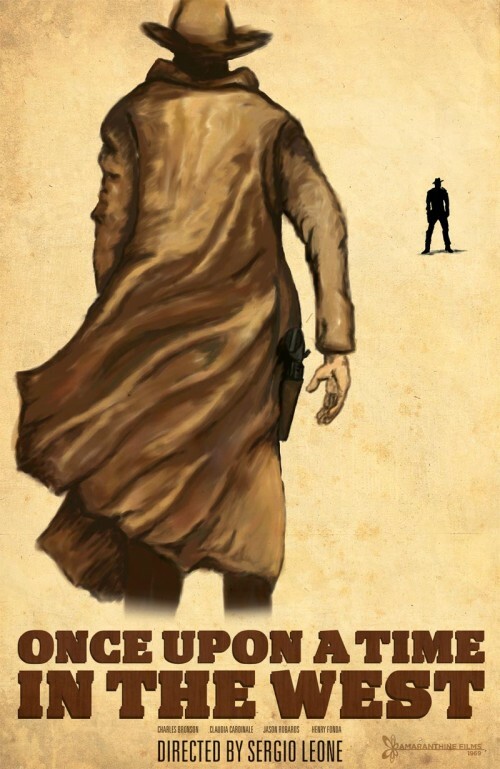 C'era una volta il West (or Once Upon A Time In The West) is the epic story of a mysterious stranger with a harmonica who joins forces with a notorious desperado to protect a beautiful widow from a ruthless assassin working for the railroad. Released in 1968 Once Upon A Time.. was the 4th Spaghetti Western by the now legendary director Sergio Leone. Leone had been responsible for the Dollars trilogy starring Clint Eastwood which started the Spaghetti Western craze in Italy. Leone was a big fan of Charles Bronson & had tried to get him for all three of his previous Westerns. Bronson turned down Leone the first time around for 'A Fistful Of Dollars' after reading the script which he described as the worst script he'd ever read. Bronson would later regret this decision & stated that 'What I didn't realise was the script didn't make any difference - It was the way that Leone was going to Direct it that would make the difference'. This is completely true, the dollars trilogy all sport very simple (to the point of being paper thin) plots. 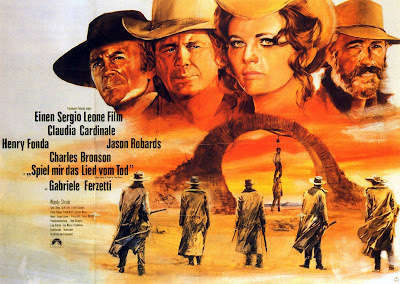 However it's Leone's style-over-substance approach which made those films so powerful with each film having a number of iconic scenes & characters throughout backed against unique cinematography & unbelievable scores by ennio morricone. In my humble opinion the dollars trilogy got better and better with each release. 'A fistful..' set the tone & showed off the then unseen style. 'A Few dollars..' combined this with a better script & improved on everything that A fistful had delivered. Then there was 'The Good, The Bad & The Ugly' which took everything which made the first two so great but had a great (yet still simple) plot to boot with three amazing characters running the show & some of the most iconic scenes to ever grace a cinema screen. 'The Good, The Bad & The Ugly' ends with one of the greatest scenes ever put on film with all three lead characters facing off in a shoot out. The tension built through the close ups of eyes, the score & the cinematography is something which you'd think Leone could never come close to again. Well guess what? Leone manages it with the opening 12 minutes of Once Upon A Time In The West with what I consider the greatest intro to a movie ever. The film opens with three nasty looking gunmen approaching a run down train station. They scare off the old employee and wait around anxiously for a train. This scene lasts a good ten minutes. What happens in this ten minutes? Hardly anything, Now you may ask yourself how on earth can this be part of the greatest intro to a movie ever but these 10 or so minutes are some of the most thoughtful & planned out scenes I've ever seen. The three gunmen (Jack Elam, Woody Strode, Al Mulock) are waiting for someone. You can feel the tension surrounding them as they wait for the train. The use of sound design in these scenes is nothing short of genius. There is no traditional score. Instead the soundtrack we hear is constructed of their surroundings and their surroundings only. First there is the monotonous squeak of a nearby windmill which comes once every 5 or 6 seconds. Then there is the constant sound of wind passing the outdoor setting. Drops of water fall through the roof onto Woody Strodes hat, the splash of each drop hitting his hat is so carefully thought out. Then there is a fly buzzing around Jack Elam as he tries to rest. The fly buzzes around Elam's face to the point where it even becomes irritating to the viewer. Jack Elam, not an Insect lover. Each of these little episodes add up create a certain level of tension which gradually reaches boiling point when the train finally begins to roll into the station. Barely a word has yet been spoken & already as a viewer the tension is almost unbearable. The train comes to a standstill & there is barely anyone departing. The 3 gunmen look on wondering where the man they are waiting for could be. The train takes off & behind the track is the lonely figure dressed in a white coat with eyes of a devil playing a Harmonica. Words cannot describe the power of this scene, it is a scene that you would find in most scripts for this type of movie however never will you find it executed with such perfection as it is here by Leone. The lonesome character is in fact Charles Bronson playing a man simply known as 'Harmonica' throughout the film. Bronson's first lines are classic with him asking where is Frank (Hendry Fonda) and asking if the gunmen had brought him a horse too which they reply 'looks like we're shy one horse' to which Bronson replies 'You brought two too many'. There's a standstill for a few seconds as the gunmen and Bronson gaze back at one another & then the guns go off. This 12 minute sequence could be a short movie in it's own right. The film could end here & you would be more than satisfied. For me it is the most obvious example I'd use to demonstrate what complete cinema is. It really does not get any better than this. Rumour has it that Leone wanted the leads from The Good, The Bad & The Ugly to play the three gun-men in this opening scene though I can't imagine Clint Eastwood who had become an enormous star through the Dollars films being happy with being blasted away within 12 minutes of the picture. Still as much as this sounds great on paper I can't imagine anybody else playing the three bandits, their faces & expressions in those opening minutes are unforgettable. The good news is the 138 minutes which follow these iconic scenes are also fantastic. This time round Leone has a story which has much more depth than anything he had dealt with for the Dollars trilogy. So we've been introduced to Harmonica. Next we are taken to a run down farm named Sweetwater where Brett McBain & his children are preparing a wedding feast as McBain has been away & married a former prostitute called Jill played by the puppy eyed Claudia Cardinale. Suddenly gunshots in the distance are heard & McBain and his daughter are shot dead. five gunmen in duster overcoats appear from a distance & the camera pans around to reveal the character of Frank played by Henry Fonda. Fonda was known for playing clean-cut good guys in the Westerns of yesteryear so when it was revealed he was the evil man who shows know mercy at shooting at defenceless child it would of been an enormous shock. So enormous that for years when being shown on American T.V they would edit out the final moments of the scene. Jason Robards is fantastic as the escaped outlaw named 'Cheyenne'. His character is an interesting one as we as the viewer are presented with a man who is on the run & we assume he is mean spirited just like the character of Frank. Though, as the film progresses we begin to warm to Cheyenne as he becomes a more sympathetic character especially towards that of Jill. Claudia Cardinale is the final part of the jigsaw. Her character really is the centre of the picture & ties together the three male leads. It would be the first time Leone had included an important female lead in one of his spaghetti westerns & he makes the character of Jill just as memorable as any of his iconic characters from past movies. The plot which ensues works perfectly with each characters actions consequently affecting the other three in some degree. This is made even more clearer by the unbelievable score by Ennio Morricone. The opening scenes may of been sound tracked by natural sounds but the rest of the picture has possibly the greatest score of all time with each of the four characters having their own theme music. When characters paths cross the score would blend these themes in and out & almost mirror what was going on between the actors. The richness to detail continues with each and every shot planned to perfection. Little things like Cheyenne walking into a bar and asking for a drink is given so much more impact by not showing his hands until he picks up the bottle to reveal that he is in fact shackled by the hands. Dialogue is kept to a mininum throughout favouring watching peoples facial expressions yet of the little dialogue there are so many memorable quotes from this film. You know, Jill, you remind me of my mother. She was the biggest whore in Alameda and the finest woman that ever lived. Whoever my father was, for an hour or for a month - he must have been a happy man. 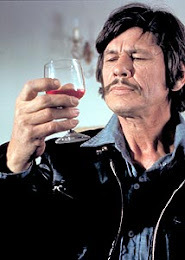 This is Charles Bronson's most iconic & for my money, greatest performance he would ever put on screen. This set the standard for the Bronson that most people would grow to know and love. It's as if that everything before this film was Bronson searching for his character, his calling card, his special trait that was Bronson & Bronson only. Through Harmonica the Bronson persona was born. Here was the quiet character who only spoke when he had to but when he opened his mouth everybody listened. A man who's stare could say more than any piece of written dialogue. A man who would fight for justice & of course.. a man of vengeance. Bronson had now gained that almost X factor which would make him almost bigger than any film imaginable. 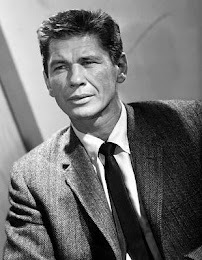 From now on people casting Charles Bronson were casting this persona. Bronson was Harmonica & Harmonica was Bronson. Even Leone himself has been quoted calling Bronson 'the greatest actor I ever worked with' & for somebody who has worked with some of the all-time great actors to make that statement & after seeing Bronson's performance here, you really can't argue with that logic. It really does get no better than Once Upon A Time In The West. Film students should be forced to sit down and watch this film, this is film-making at it's purest form. The direction, performances, score, cinematography, script & dialogue all come together to make what I can only describe as.. perfection. Throw Bronson into the mix & you have the greatest film of all time. 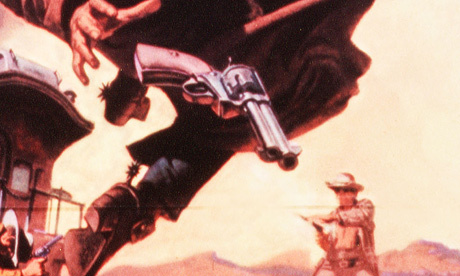 My favorite film of all time and the best Western of all time, and there are many of those. The opening scene is a masterpiece in itself. No dialogue, just three men waiting for a train, amusing themselves as they wait. "You brought two too many". You knew the poop was going to hit the fan then. This movie had so many great points to it, the scenery was breathtaking, I love the soundtrack (I bought the CD). But when I describe the movie to those who haven't seen it, I tell them westerns have a similar theme. Usually it's always someone seeking vengeance, as you pointed out. But we the audience don't know why, or who that man is in the flashbacks during the haunting harmonica music. When that 'why' is finally revealed at the end, it was the most despicable act one human could perpetrate on another, with the utmost cruelty. I don't think Sergio Leone could have done any better, he created a beautiful masterpiece and I wouldn't have changed a thing, well maybe seeing Claudia Cardinale naked would have been nice, but that wouldn't have lent anything to the film. In closing I want to say thanks for your review and not revealing the end to those who haven't seen it. People ask me and I tell them you have to see the whole film. Best western ever! Charles Bronson is the best good guy cowboy ever. LOVE IT!